Most of us reach for coffee or tea to get our morning and afternoon boosts. Did you know that studies have shown that caffeine can also be beneficial to our skin and hair by improving circulation, providing nourishment and combating harsh environmental factors? 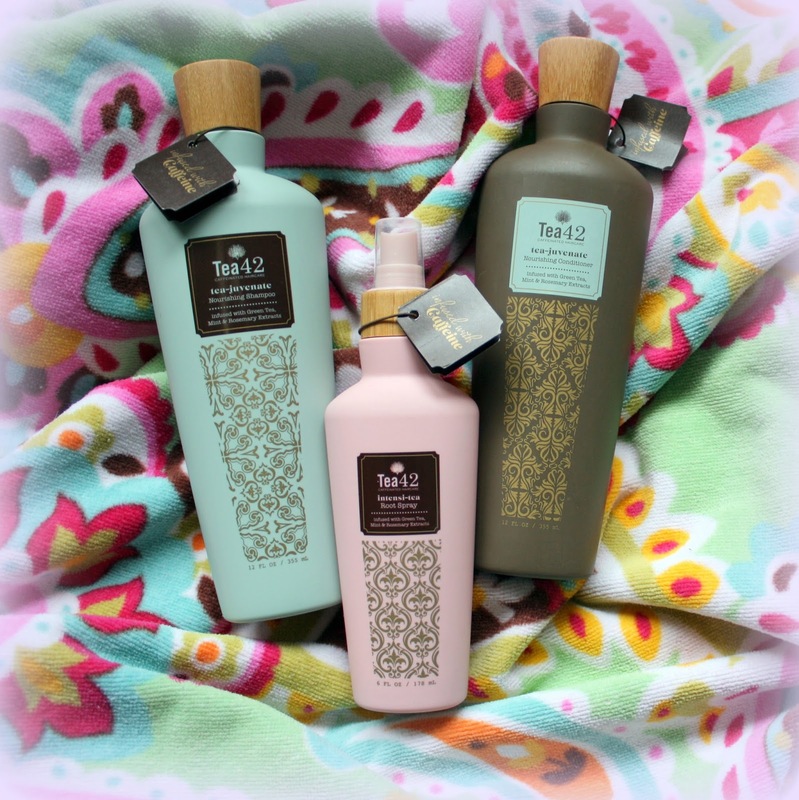 Enter Tea42, a new hair product line of caffeinated sulfate free shampoo, conditioner and leave in conditioner. The powerhouse ingredient behind these products are caffeine along with green tea, mint, antioxidants and vitamins designed to replenish and rejuvenate dry, damaged hair and aid in the production of new hair growth. I've been using the Tea42 product line for the past few weeks and saw immediate results. My hair was softer, shiner and full of body. The shampoo is not a lathery shampoo and a little goes a long way. Like a conditioner, you leave it on your head for a few minutes before rinsing. The mint is invigorating and gives your head a little tingle. Follow up with the conditioner that you leave in for 3-5 minutes before rinsing and your left with silky hair and no detangling needed. The third product in this line is the root spray. Spray on towel dried hair in 2 inch sections, let stand for a few minutes then comb through and style your hair as normal. I opted to forgo my other styling products to see the full effects of this leave in conditioner. My hair dried quicker, was less frizzy and felt lightweight and styled to perfection! All three of these products smell amazing and are organic, paraben free, sulfate free cruelty free. Try them out yourself by clicking here and use promo code TEA42DIP! Wishing all of my US readers a Happy Thanksgiving! Thursday Fashion Files will be back on December 3rd!